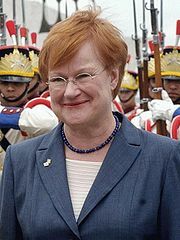 Tarja Kaarina Halonen (born 24 December 1943 in Helsinki) is a Finnish politician who served as president of Finland from 2000 to 2012. Women receive easily the most difficult assignments. This page was last edited on 16 August 2018, at 11:08.